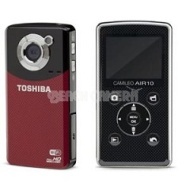 alaTest has collected and analyzed 22 reviews of Toshiba Camileo WiFi Full HD 1080P Camcorder with 4GB SD Card. The average rating for this product is 3.6/5, compared to an average rating of 4.0/5 for other Camcorders for all reviews. Reviewers really like the size. The battery is also appreciated, whereas some have doubts about the reliability and image quality. There are some mixed opinions about the portability. We analyzed user and expert ratings, product age and more factors. Compared to other Camcorders the Toshiba Camileo WiFi Full HD 1080P Camcorder with 4GB SD Card is awarded an overall alaScore™ of 80/100 = Very good quality. Great camera for the price and it is easy to use. Takes great photos also.